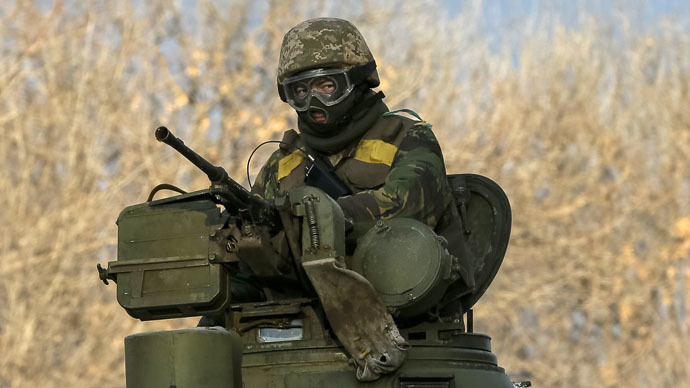 Citing an anti-Russia policy brief, US lawmakers approved $200 million for providing “lethal weapons of a defensive nature” to the Ukrainian government as part of the $600 billion Pentagon budget proposal for the fiscal year 2016. The House Armed Services Committee passed its proposal for the 2016 National Defense Authorization Act (NDAA) with a bipartisan vote of 60 to 2, in whatDefense Newsdescribed as a “marathon” session that ended around 4:30am on Thursday. Section 1532 of the 498-page document calls for the US to provide assistance, “including training, equipment, lethal weapons of a defensive nature, logistics support, supplies and services, and sustainment to the military and national security forces of Ukraine” through the end of September 2016. Members of the 173rd Airborne Brigade arrived in Ukraine earlier this month as part of a training program aimed at Kiev’s military and security forces, prompting the Russian Foreign Ministry to question Washington’s motives. “What will these foreign military experts teach them – how to continue killing those who speak Russian?” asked Russian Foreign Ministry spokesman Aleksandr Lukashevich. Lawmakers have also pushed the White House for months to send lethal aid to Kiev. Last month, the House passed a non-binding resolution with a 348-48 vote, demanding lethal weapons aid for the “people of Ukraine to defend their sovereign territory from the unprovoked and continuing aggression of the Russian Federation.” However, the White House has remained silent on the issue. Congress approved weapons delivery for Ukraine. Obama does not. So Ukraine gets no US weapons. Most of the draft legislation deals with funding the various weapons procurement programs. Additionally, up to $429 million would be allocated to Kurdish and Iraqi Sunni forces fighting the so-called Islamic State (IS, also known as ISIS).